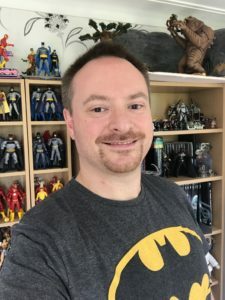 I’m Richard Russell, an avid comic book and sci-fi fan and collector of action figures for many years. Whilst searching the internet for ideas to combine my love for science fiction and my passion for three dimensional art I came across dioramas, and was inspired by works from people around the world. I took the plunge into building my first diorama and was quickly bitten by the building bug. It has now taken on a life of its own, from not only dioramas but also custom figures, and is a much enjoyed past-time. As the number of completed projects started to build up I began publishing my work on my Facebook page. There I have published all my work in progress pictures, taking you through the journey of each piece from concept through development and on to final completion. I am delighted this year to have been commissioned to build several custom pieces for other enthusiasts across the globe! If you would like to get in contact with me to discuss ideas or are interested in chatting about a commission build, please do drop me a message.